The 2019 Texas Land Conservation Conference was held Wednesday, February 27 - Friday, March 1, 2019 at the Hilton Austin Airport in Austin, Texas. This conference is the preeminent statewide meeting for anyone working in the field of land and water conservation, private landowners interested in conserving their land, government, business and NGO agency partners, and any person interested in learning more about these important issues in Texas. The annual three-day conference brings in experts from around the state and nation to provide unparalleled networking and education opportunities and provides an exceptional opportunity for shared learning and engagement in order to advance the land conservation movement in Texas. The Texas Land Trust Council (TLTC) is a nonpartisan, nonprofit organization that builds and supports a strong, active coalition of more than 30 organizations working to conserve the lands and waters of Texas. 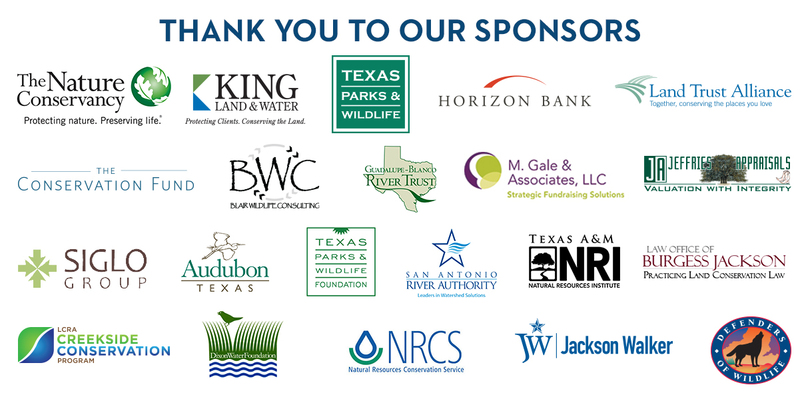 As a member of TLTC, you are a partner in our statewide mission to advance land conservation across the State of Texas.